The teachers I remember most have always been those who have taught me that we can be serious about what we're learning while keeping a sense of humor at the same time. A great deal of Jesus’ effectiveness as a preacher comes from his being able to teach very serious things, and perhaps keep a serious face while telling people something rather funny. The guy obviously had a great sense of humor. Of course, one has to read the gospels carefully to see it. Once, for instance, two of John the Baptist’s disciples began following him. He notices them, turns around and says, “What do you want?” “Master”, they reply, “where do you live?” “Come and see”, he tells them-- this despite the fact that he didn’t have a house: “Birds have nests, foxes have lairs but the son of man has nowhere to lay his head”. “When a Roman makes you carry his baggage for one mile, go with him two miles”, he tells people in another part of scripture—knowing fully well that if they did—the Roman would surely be punished because they were only allowed to make Jews carry things for a mile. It is perhaps in this context that we can understand the puzzling story in today’s gospel reading. How else could we explain the fact that he presents as a model for us, a man totally without the qualities of what we would normally call a ‘good person’? The story is about as choice a set of rascals and scoundrels one could meet anywhere. The steward was a rascal. He was a slave, but he was put in charge of running his master's estate. The master was obviously an absentee landlord who entrusted his property to him. But he followed a career of embezzlement and was now about to be fired. Those who owed the master were also rascals. They owed a lot. But they were too unscrupulous to care when the steward falsified the book entries so that they were debited with far less than they owed. But the master himself was something of a rascal; because instead of being shocked and horrified at the whole affair, he appreciated the cleverness of his corrupt servant. Now why would Jesus be telling a parable like this unless he wanted to draw out something serious from something totally ridiculous? And the Jewish rabbis, from time to time, did in fact use humor whenever they wanted to make a very serious point. That perhaps is what Jesus is doing in the gospel. He isn’t in any way suggesting that one should emulate the corrupt servant, or the unscrupulous debtors, or the equally crazy landowner. But he is reminding us—gently, and with much humor—that there is something we can learn from all of them. They were, after all, typical men of the world, who have given all their energy to achieving money and the good life. They were what Jesus calls the “children of this world”. And we are told that if we, his followers, would only show the same dedication and resolve in pursuing goodness, we could achieve so much more! And neither is he telling us that wealth is bad or that we should neglect our worldly affairs. He is, however, telling us to regard things in the proper perspective; and that while some of us find ourselves having to actively pursue the treasures of this world, we should just as eagerly pursue the treasures of heaven. 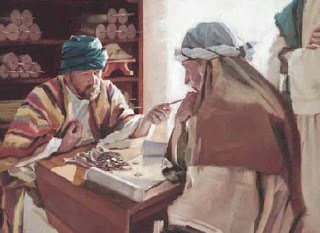 Behind the humor of our gospel today then, are lessons Jesus would want us to seriously think about: [i] If only we were as eager and ingenious in our attempts to attain goodness as the rascals in the gospel are in attaining money and comfort, we would all be better persons. [ii] If only we would give as much attention to things which concern our souls as we do the things which concern our business, we would be much better men and women. [iii] And If only we would desire God as eagerly as we sometimes desire material wealth, we wouldn’t only be wealthy, we would be truly wealthy. For we will possess wealth that “no moth can destroy, no rust can corrode, and no thief can ever steal”.